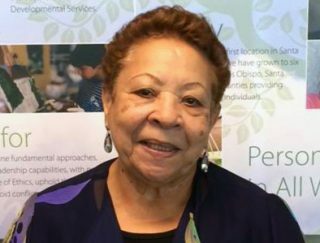 The Tri-Counties Regional Center Foster Grandparent Program establishes person-to-person relationships between limited income adults, 55 years of age and older, to children receiving services from the Regional Center. The Foster Grandparent Program is a national program and has been active in Ventura, Santa Barbara and San Luis Obispo counties since the late 1990s. The Program is funded through the Corporation for National and Community Service and the California Department of Developmental Services. Foster Grandparent volunteers bring a lifetime of experience to children and provide an opportunity for them to more fully participate in school. Foster Grandparents serve children in schools throughout San Luis Obispo, Santa Barbara and Ventura Counties. The Senior Companion Program shares the same philosophy and goals as the Foster Grandparent Program; however, they serve adults 21 years of age and older. Senior Companions serve at adult day care/health centers and other day programs throughout the Tri-Counties area. For further information about the Foster Grandparent and Senior Companion Programs, contact: Rebekah Nagel, Program Manager at 805.884.7226 or rnagel@tri-counties.org.